Crowns and conventional bridges or dentures may not be your only options when replacing missing teeth. For some people, dental implants offer a smile that looks and feels very natural. Implants are surgically placed below the gums over a series of appointments, and fuse to the jawbone. Implants offer stability because they fuse to your bone, a process called osseointegration. Integration of the implants into your jaw also helps your replacement teeth feel more natural, and some people find the secure fit more comfortable than conventional substitutes. Some wisdom teeth emerge without any problems, but many times wisdom teeth are often removed as a preventative measure, as they are prone to infection and other oral health problems. Even if your wisdom teeth are not currently showing signs of a problem, it is important to have them evaluated to make sure the wisdom teeth and the surrounding teeth and tissue remain healthy. Many patients have had traumatic experiences in dentistry or have other anxieties about their treatment. 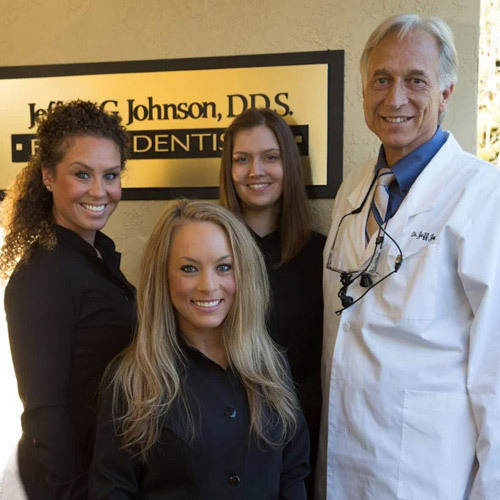 At Jeff Johnson, DDS, Dr. Johnson strives to meet your individual comfort needs. For our patients with anxiety, sedation dentistry may be the answer. We offer both nitrous oxide and oral (conscious) sedation as options for our patients.